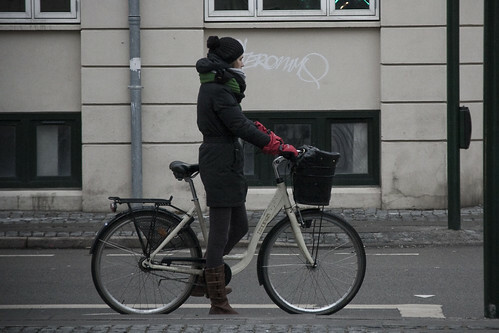 Two of the classic postures Copenhageners assume whilst waiting for the light to change. Above, The Half-Ready Pedal Placement and below, The Copenhagen Straddle. See more on the Red Light Posture Series post. 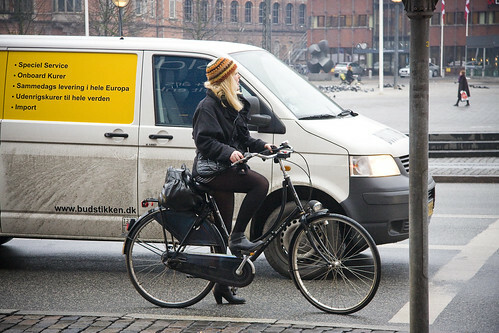 If you like, you can click on over to Copenhagenize.com and see how the City of Copenhagen holds on tight to their cyclists by giving them something to hold to. Yup. It's truly convenience for cyclists..I hope Malaysia also have something thoughtful as this..
U nas w Warszawie też jeździ sporo rowerzystów mimo zalegajacego śniegu. Są wśród nich tez kobiety! Amazing ! a site just for cycling fashion ! excellent layout as well ! Oh to be so. I wish, but it's not going to happen. And where are all the chic men? Or is that a contradiction? chic men? scroll, darling, scroll. or choose the Bicycle Fashion for Men tag in the Categories on the right. In the first shot, what exactly is the girl wearing? A skirt and hose or pants? Looks like a skirt and hose. How cold is it out? Your subjects have such great posture, as if they are in an equestrian competition. It is definitely a more formal stance than our laid back California bicyclists. She's wearing a skirt and hose. It's about minus 5 Celcius, plus extra for wind chill. WOW!!! I love this site did you know that riding your bike saves the earth and me and my friends are big on saving the earth! Anyways check out my site the URL is emzdog.blogspot.com thx bye. 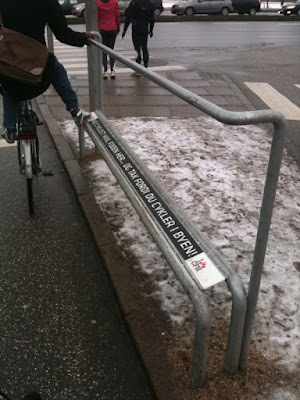 It's very nice and interessing to know that City of Copenhagen accept and take care of their cyclists. Congratulations and I think is something to be proud of. kiss. Very cool, I love it it's interesting. "I love this site did you know that riding your bike saves the earth . . ."
lovely images. but gosh it looks cold. bring on the summer! I'm like the woman in the first photo. I rarely get off my saddle. We have now formed the Swedish Republic In Exile. Sadly enough, in Sweden we still have a Monarchy, with a King and a class of Nobility with Counts and Barons. Such an antiquated institution is obviously in contradiction with modern democratic developments. The absurd Monarchy preserves obsolete privileges for the Aristocracy in a medieval manner, also imposing Christian Protestantism as the State Religion. We have therefore formed the Swedish Republic In Exile, based on equal rights and equal duties. We are going to strive for equality and dignity through logic and reason. Like the USA and France so many years ago, also the Swedish People should be given the right to be equal under the law. As you are involved in Swedish affairs, we ask you to support and to publicize our efforts to bring real democracy to Sweden. You are also welcome to apply for Citizenship in the Republic of Sweden/In Exile: it is an open International Organization, with a view to create just societies. Thank you for your support for the enhancement of international democracy. Please forward this e-mail to family, friends, and colleagues. HEI! !, VEJAM, É TÃO FÁCIL E SIMPLES SER FELIZ, É SÓ OLHAR ATENTAMENTE NA SIMPLICIDADE DESTAS FOTOS E SONHAR, QUE MUNDO MARAVILHOSO DEUS NOS OFERTOU.